They met at the Harwyn Club on East 52nd Street, the posh Manhattan nightspot where Prince Rainier courted Grace Kelly and the regulars included boxing champ Rocky Marciano and film star Judy Garland. He was the toast of Broadway and the Bronx, the handsome, home-run-swatting slugger for the New York Yankees who could do it all on the field and get away with just about anything off it. She was a blue-eyed belle from Birmingham, Ala., an aspiring actress who didn’t know a squeeze play from a sacrifice fly, and who cared even less. That night sometime back in the 1950s — the date has been blurred by the passing years, but the scene is etched in her memory — the maitre’d came to her table and told her that “Mr. Mantle” would like her to join him. Mickey Mantle didn’t come to her table, though. Instead, he followed Margie Bolding to the ladies’ room. And that, as Bolding remembers in author Jane Leavy’s revealing new biography “The Last Boy: Mickey Mantle and the End of America’s Childhood,” is how Margie met The Mick. It was just the beginning of what Bolding fondly calls a “unique and personal” relationship. A half-century or so later, it’s easy to see why Mickey also adored Margie, who, at 75, is still a striking woman with hair as fine as straw and a voice that could melt butter. Soon after Sports Illustrated ran an excerpt from “The Last Boy” the week before Leavy’s book came out on Oct. 12, the phone calls started. Her mailman wondered if she got a cut, a suggestion that the well-mannered Bolding found mildly offensive. In her nearly century-old house on the crest of Red Mountain, Bolding likes to sip green tea in the kitchen that looks more like a Bolding family shrine. The walls are covered with old photographs of her and her four sisters — “the fabulous Bolding girls,” as Leavy calls them — and the shelves are crammed full of dozens of ceramic teapots she’s collected through the years. But there’s not a picture of her with Mickey Mantle to be found anywhere. They’re stashed away in plastic storage tubs, Bolding says, and since she’s had to move everything around while workers renovate her house, she’s not sure where they are. She had to rummage through a closet to find the gray cowboy boots with the red hearts that Mantle bought for her from his teammate Billy Martin’s country-and-western store. 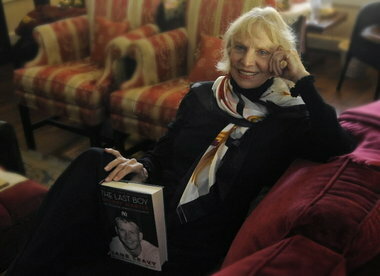 A former Washington Post sportswriter and author of “Sandy Koufax,” a biography about the Los Angeles Dodgers pitching great, Leavy spent five years writing and researching “The Last Boy,” a book so painstakingly detailed that she tracked down a physics professor to help her recalibrate the distance of the almost-mythical home run that Mantle hit out of old Griffith Stadium in Washington, D.C., in April 1953. Barra had interviewed Bolding for another story years before, and she had shared with him some of her memories of her times with Mantle. Barra suggested Leavy give her a call. The two strangers hit it off from the start. After she hung up, Leavy knew she had found the woman who could help her tell Mantle’s story better than anyone. Mantle, who married his Commerce, Okla., high school sweetheart Merlyn Johnson after his rookie season with the Yankees, always had lots of other women in his life, but as Leavy would discover, there was only one Margie. “Obviously, she was a very gracious and literate and sophisticated woman,” Leavy says. “And her perceptions and her ability to describe in beautiful language parts of this man were invaluable. She really got him. Her long-distance interviews with Bolding trumped even those with Mantle’s closest Yankee teammates, Whitey Ford and Yogi Berra included, Leavy says. “People always ask me what was the most informative interview of the 563, and I always answer not necessarily in the way that they intend,” she says. “I don’t answer it as who gave me the most information, but (as) whose description most informed my take on Mickey Mantle. Leavy inscribed those same sentiments in a personalized copy of “The Last Boy” that she sent to Bolding a couple of weeks ago. The two, however, have still yet to meet in person. The youngest of seven Bolding siblings — five girls and two boys — Margie grew up in Decatur, where her father, O.T. Bolding, was the minister at Grant Street Church of Christ. As a teenager, she came to Birmingham, where she attended Phillips High School. She later went to New York, where her sister Bonnie also lived, in hopes of becoming an actress. Early in their relationship, Bolding says she established the ground rules with her famous ballplayer friend. She left, she says, and Mantle came running out after her, helping her hail a cab for her ride home. Later, he apologized, she says. While Mantle’s extramarital exploits were almost as legendary as his tape-measure home runs, Leavy says she had no interest in knowing the specifics of his friendship with Bolding. “I did not press her for details,” Leavy adds. “I don’t know them, and I don’t care to know them. I don’t know what the complete nature of their relationship was. It wasn’t interesting to me. During their time together, Mantle also became friends with Bolding’s sisters Bonnie, a New York stockbroker, and Janie, a fashion model and clothing buyer who came to the city on business trips. They shared secrets while they played games of truth in Bonnie’s apartment, and whenever Janie came to town, Mantle invited her to come hang out with him and his Yankee playmates. When the Yankees were at home, he would get Margie and her youngest son, Ernie, tickets behind the Yankees’ dugout, and once, on a road trip to Chicago to play the White Sox, he brought flowers to her mother, Gertha Bolding, when she was in the hospital. As fun-loving in their golden years as they must have been in their youth, three of the Bolding sisters — Margie, Bonnie and Janie — are all back together again in Birmingham. They still have as much fun hanging out with each other, they say, as they ever did with anybody else. Margie Bolding, who left New York to come back to Birmingham years ago, says she and Mantle remained long-distance friends for a while but eventually lost touch with each other. Sixteen months later, and less than two months after receiving a liver transplant, Mantle died with Merlyn at his bedside — an old man at 64. Bolding wrote her old friend a letter before he passed away, but she’s not sure if he ever read it, or if he even received it. So a few days ago, after Leavy’s book rekindled some of her memories of Mickey, she took out a pen and started another letter. The words came in a flurry, filling 11 pages in a composition notebook. As Bolding reads her letter aloud in her living room, though, it’s as if this “grande dame of theater,” as Leavy calls her, is back on stage.